Central Phoenix’s favorite Asian restaurant and craft cocktail bar, the Clever Koi is excited to announce the opening of a second location coming to Gilbert this fall. Scheduled to open this September inside a custom-designed space at the SW corner of Gilbert & Vaughn Avenues (384 N. Gilbert Rd., #101, 480-284-7529) in the heart of Gilbert’s historic downtown dining district, this all-new Clever Koi will feature the same menu of modern twists on classic Asian dishes that made the original location a critical and popular favorite, as well as its award-winning cocktail program highlighted by modern mixology and classic tiki drinks to the East Valley. Best of all, the new Clever Koi in Gilbert will serve up lunch and dinner daily (the Phoenix location closes on Sundays), as well as daily happy hour and brunch served from 11 am – 3 pm on Saturdays and Sundays. Tucked inside the brick-accented Heritage Marketplace building, Clever Koi in Gilbert will feature a striking modern Asian décor, fully visible thanks to the large glass front façade. Even cooler, the front façade features sliding glass window leading to a spacious 40-seat outdoor dining patio boasting great people watching on bustling Gilbert Avenue. Stepping inside, guests will discover an open floor plan featuring a 62-seat dining room and a smaller bar-dining area featuring both highboy tables and bar seating. Here, guests can soak in the exposition-kitchen where three huge, fiery woks will create a visual and aromatic feast while soaking in the bold décor highlighted by Asian-style accents and warm, organic colors that are both modern and also a nod to Gilbert’s rustic roots. Not to mention custom dimensional tile art installations by Matt Noakes of Phoenix’s Rain Made Design. 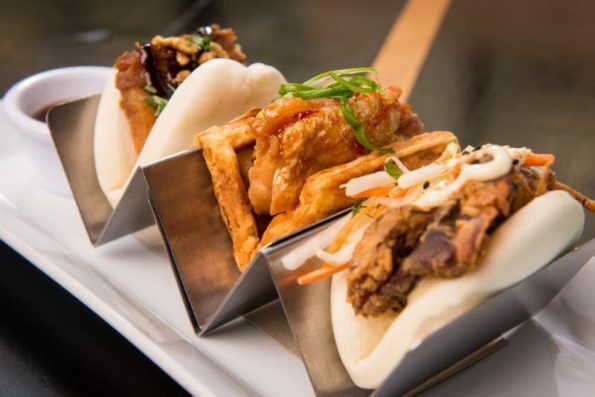 The real draw at Clever Koi in Gilbert will be its bold, flavorful menu of Asian-style rice bowls, house made dumplings, steamed buns, noodles and more. Led by Executive Chef/Owner, Jared Porter, along with GM/Owner, Nicholas Campisano and Beverage Program Director/Owner, Joshua James, Clever Koi’s seasonal menus reflect flavors and techniques from regions such as Thailand, Korea, China, Vietnam, Japan, and Indo-China. Plus don’t miss happy hour featuring specially-priced dishes such as wood-grilled Koi Burger on a torta-like Telera bun topped with Gojuchang Mayo & sharp cheddar and served with a side of Salt & Pepper Fries, or Pork Ramen brimming with Braised Pork Belly, Kimchi, Bamboo Shoots & Soft Egg. Or cool off with with $4 draft beers, $7 wines by the glass and your choice of 15 classic cocktails such as the Paloma (Blanco Tequila, Maldon Sea Salt, Grapefruit & Lemongrass Soda) or a Pimm’s Cup (Pimm’s No. 1, Fernet, Sparkling Lemonade, Cucumber & Mint) for only $7. Next → Next post: France’s Artisan Caviar Pioneer STURIA Debuts in the U.S.